Delicious baked citrusy apples & pears. Ideal for using up over-ripe fruit. Serve hot or cold, with or without plain yogurt, or custard. Follow a recipe; follow food safety & hygiene rules; tidy away; use measuring spoons and cups; chop using bridge/claw technique; use a vegetable peeler safely; use a citrus squeezer/zester. Oven dish, vegetable peeler or zester, citrus squeezer, measuring spoons, chopping board, knife, foil. Place the prepared pear & apple pieces in an oven dish with the cinnamon and nutmeg. Use the peeler to peel the orange and lemon zest into strips, and add to the dish. Squeeze the juice from the orange and lemon and pour over the apples and pears. Stir in the raisins or sultanas and water. 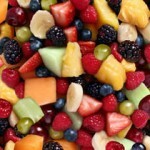 Cover the dish with foil and bake for about 35-40 minutes or until the fruit is just soft. 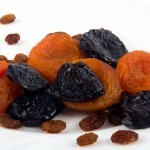 Dried Fruit such as apricots and raisins are high in fibre and iron. A 30g portion counts as one portion of your 5-a-day. Due to its high sugar content dried fruit should be eaten at mealtimes, not as a between-meal snack, to reduce the risk of tooth decay.